Srinagar, Nov 8: People continued to shiver as the maximum and minimum temperatures remained several degrees below normal in Kashmir valley, where frequent and unscheduled power cuts and exponential price rise of woollen clothes and essential commodities, including vegetables, have badly affected the normal life. Majority of places in the valley witnessed some improvement in the night temperature due to overcast conditions, though it was still below the freezing point. The border town of Kargil was coldest in the region at minus 8.6 degree Celsius, followed by Leh at minus 5.7 degrees. A Met department Spokesperson told TNN that weather will remain dry during the next 24 hours in the valley, which could result in further dip in the temperature. However, he said a fresh Western Disturbance (WB), which originated from the Arabian Sea and is approaching the region though Afghanistan and Pakistan, will hit the state on Friday. ''Under the influence of the WD, rain and snow would occur at few places on Friday,'' he said, adding that the system will grow stronger on Saturday onwards, resulting in moderate to heavy snowfall. Even though there was an improvement of three degrees from Wednesday, the night temperature at Leh settled at minus 5.7 degrees. The mercury in Kargil also witnessed marginal improvement, as it settled at 8.6 degrees, against 9 degrees recorded on Wednesday. After witnessing an improvement of about two degrees from Wednesday, people woke up to a sunny Thursday, though the chill continued due to ice cold winds, in this summer capital. However, as the day progressed, weather turned cloudy, resulting in further dip in the day temperature at Srinagar, where the maximum temperature recorded on Wednesday was several degrees below normal. Meanwhile, people in the city alleged that despite one-way traffic on Srinagar-Jammu national highway, the only road connecting Kashmir with rest of the valley, the prices of essential commodities, including vegetables, have increased many folds in the last about a week. Unscheduled and frequent power cuts have also added to the problems of people in the valley. ''Unscheduled and frequent power cuts have badly affected our lives, even as biting cold conditions continued in the valley. As soon as 'Darbar Move' offices shift to the winter capital Jammu, people suffer due to unscheduled and frequent power cuts. In 24 hours, power goes off for about 10 to 12 hours,'' Hilal Ahmad, a resident of Budshah Nagar, told TNN. 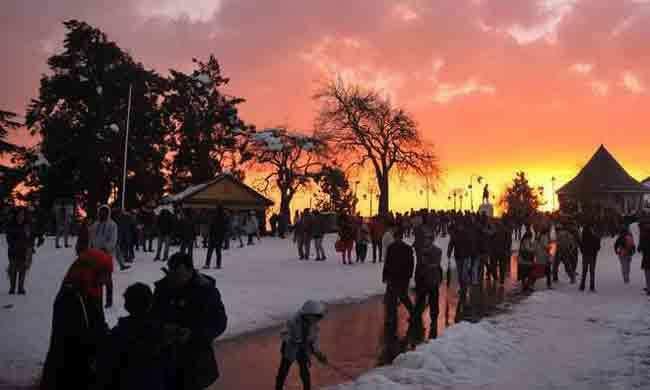 Against minus 2.2 degrees, which was the coldest night temperature recorded in Srinagar this season so far, mercury improved and settled at minus 0.4 degrees on Thursday. The night temperature in Srinagar was still two degrees below normal. Despite an improvement of a degree from Wednesday in the night temperature, the world famous ski resort of Gulmarg was still the coldest place in the valley. Against 6.6 degrees recorded on Wednesday, the night temperature in Gulmarg, about 55 km from here in north Kashmir, was minus 5.4 degrees, which is over five degrees below normal. After witnessing the coldest night of the season so far at minus 5.2 degrees on Wednesday, mercury at the world famous health resort of Pahalgam improved and settled at minus 3.4 degrees, which is still two degrees below normal. Mercury at Qazigund, gateway to the valley, Kupwara in north Kashmir and tourist resort of Kukernag improved and settled at minus 1.8 degrees, minus 2 degrees and minus 0.3 degrees, respectively. The night temperatures at these places were three degrees below normal.